Finish Manufacturing Processes are those final stage processing techniques which are deployed to bring a product to readiness for marketing and putting in service. Over recent decades a number of finish manufacturing processes have been newly developed by researchers and technologists. Many of these developments have been reported and illustrated in existing literature in a piecemeal manner or in relation only to specific applications. For the first time, Comprehensive Materials Finishing integrates a wide body of this knowledge and understanding into a single, comprehensive work. Containing a mixture of review articles, case studies and research findings resulting from R & D activities in industrial and academic domains, this reference work focuses on how some finish manufacturing processes are advantageous for a broad range of technologies. These include applicability, energy and technological costs as well as practicability of implementation. The work covers a wide range of materials such as ferrous, non-ferrous and polymeric materials. There are three main distinct types of finishing processes: Surface Treatment by which the properties of the material are modified without generally changing the physical dimensions of the surface; Finish Machining Processes by which a small layer of material is removed from the surface by various machining processes to render improved surface characteristics; and Surface Coating Processes by which the surface properties are improved by adding fine layer(s) of materials with superior surface characteristics. 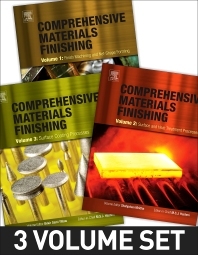 Each of these primary finishing processes is presented in its own volume for ease of use, making Comprehensive Materials Finishing an essential reference source for researchers and professionals at all career stages in academia and industry. Saleem Hashmi is Emeritus Professor in the School of Mechanical & Manufacturing Engineering at Dublin City University, Ireland. He founded the School in January 1987, in addition to setting up the Material Processing Research Centre (MPRC), a research centre of excellence in the field of material processing. In 1990, Professor Hashmi established Advances in Materials and Processing Technologies (AMPT), a much-needed international conference in materials processing. He continues to be the chairperson of the Steering Committee for this series of conferences. In 1998 he was appointed as editor-in-chief of Elsevier Journal of Material Processing Technology and continued in this role until 2008. In 1995, Professor Hashmi was awarded the higher doctorate degree of DSc, by the University of Manchester, the highest academic degree any university in the UK can award. Professor Hashmi has supervised or co-supervised 110 PhD and 55 MEng research students to successful completion. Over the years he has also acted as an external examiner and expert assessor for PhD candidates and engineering departments with universities in Ireland, the UK, India, Pakistan, Bangladesh, Hong Kong, Canada, Australia, and Malaysia. He has published in excess of 430 papers and 12 books so far. He has been Editor-in-Chief on two MRWs with Elsevier, Comprehensive Materials Finishing and Comprehensive Materials Processing. Emeritus Professor, School of Mechanical & Manufacturing Engineering, Dublin City University, Ireland.